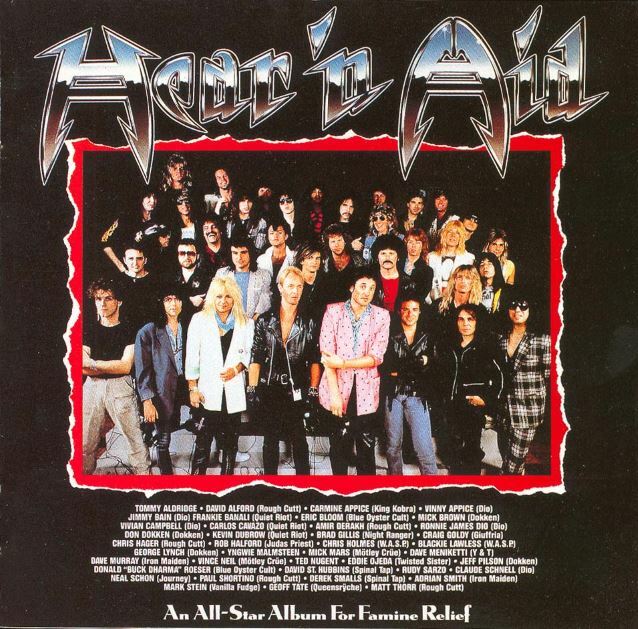 Ronnie James Dio's widow/manager Wendy Dio has confirmed that a modern-day version of HEAR 'N AID, the one-time collaboration of various individual heavy metal/hard rock artists in 1985 to raise money for famine relief in Africa, will be assembled to record a new song that will be released alongside the upcoming reissue of the "Stars" single and video documentary on the making of the original HEAR 'N AID record. On May 20 and May 21, 1985, 40 artists from the metal community gathered at A&M Records Studios in Hollywood, California to participate in the making of a record called "Stars" as a part of a very special fundraising project spearheaded by Ronnie James Dio known as HEAR 'N AID. 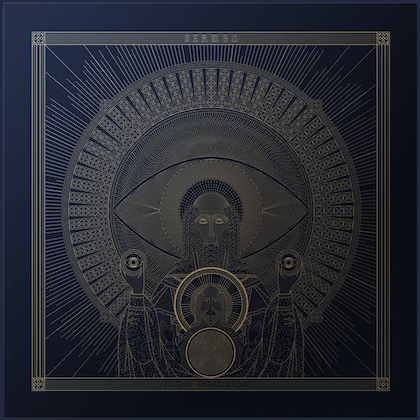 The "Stars" single and a video documentary on the making of the record was used to raise money for famine relief efforts in Africa and around the world. These 40 artists — including members of MÖTLEY CRÜE, JUDAS PRIEST, IRON MAIDEN, QUIET RIOT, TWISTED SISTER, BLUE ÖYSTER CULT and even SPINAL TAP — along with hundreds of other volunteers, donated their time and talent over four months to make HEAR 'N AID a reality. "Stars" was a plea for unity in the fight against world hunger. Due to contract differences with the labels, the "Stars" song and album weren't released until New Year's Day, 1986, and were only ever made available on vinyl and cassette. But Wendy Dio (pictured) plans to fix that. "We are in talks right now with a couple of record labels to reissue HEAR 'N AID, with the funds going to [the Ronnie James Dio] Stand Up And Shout [Cancer Fund, the charity founded in memory of the late singer]," she said during an appearance on the on the March 30 edition of Eddie Trunk's SiriusXM satellite radio show, "Eddie Trunk Live". "We have so much stuff that was never released before — behind-the-scenes stuff that was shot during the whole time. We have photos galore of everybody that was involved in it, and I think it'll be fantastic. We just have to work on it. It may not come out this year, because I want everything to be perfect, as Ronnie would want it to be, but I am in talks about it, and that will be coming out, definitely." 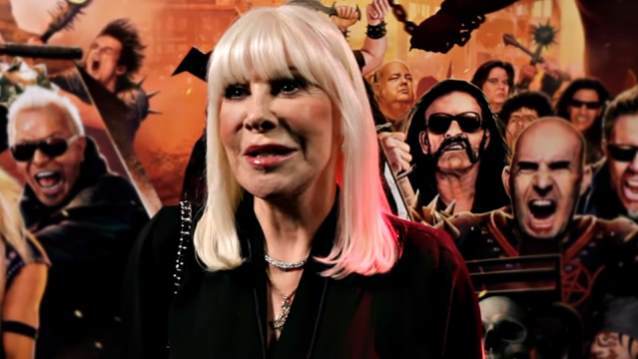 Wendy also revealed that a new HEAR 'N AID-style song will be recorded by as-yet-undisclosed classic and contemporary artists to raise funds for the Ronnie James Dio Stand Up And Shout Cancer Fund, which has already raised close to $1 million in its short history. "That's something we're working on as well," Wendy confirmed. "We wanna make something really special for the fans and to raise money, of course, for the cancer fund." Wendy previously revealed that one of the reasons the HEAR 'N AID reissue was taking so long to come out was the "legal stuff" that needed to be taken care of. "You can always get the bands to do something, but it's the legal licensing of talking with the record labels they're on and the management and so on, to get something off the ground," she said. "So we're hoping to do that." For the 1 million messages I got because of @BLABBERMOUTHNET....NO I was not asked to sing on the @OfficialRJDio hearing aid song! Sorry!